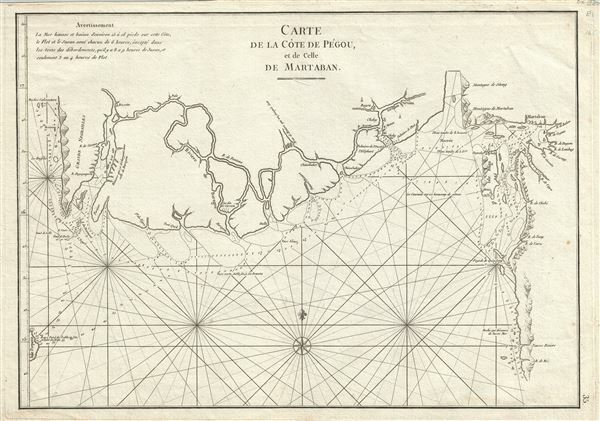 Scarce nautical chart of the coast of Myanmar. Carte de la Cote de Pegou et de Celle de Martaban. The map offers rich detail including countless depth soundings, notes on the seafloor, commentary on reefs, rhumb lines, shoals, place names and a wealth of other practical information for the mariner. This chart was drawn by Jean-Baptiste d'Apres de Mannevillette for publication in the 1775 Neptune Oriental. Very good. Original platemark visible. Minor overall toning and some spotting.